Explanation: Our Sun has become quite a busy place. Taken only two weeks ago, the Sun was captured sporting numerous tumultuous regions including active sunspot regions AR 2036 near the image top and AR 2036 near the centre. Only four years ago the Sun was emerging from an unusually quiet Solar Minimum that had lasted for years. 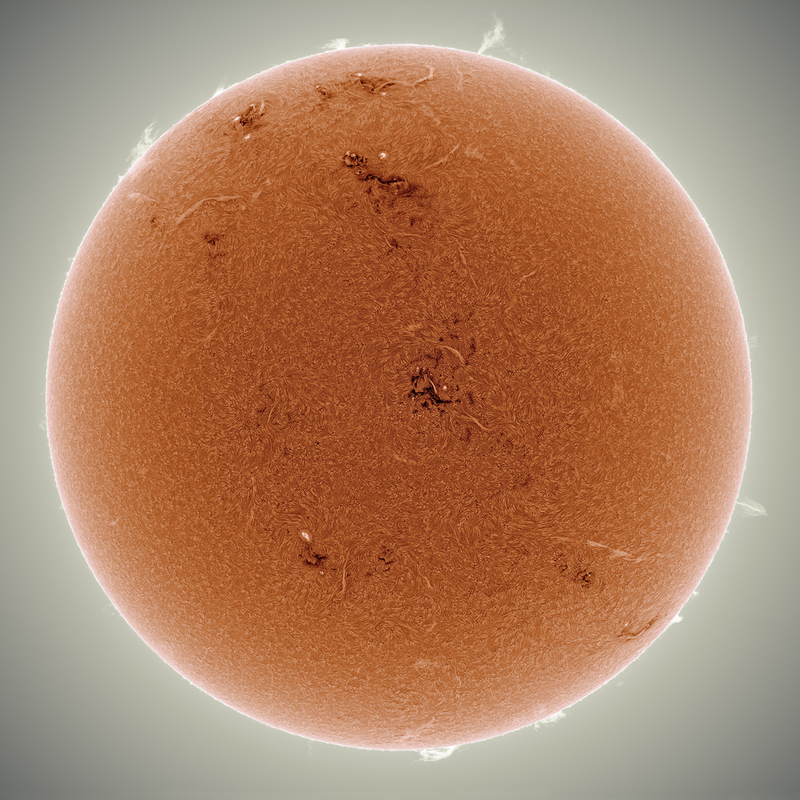 The above image was recorded in a single colour of light called Hydrogen Alpha, inverted, and false coloured. Spicules cover much of the Sun's face like a carpet. The gradual brightening towards the Sun's edges is caused by increased absorption of relatively cool solar gas and called limb darkening. 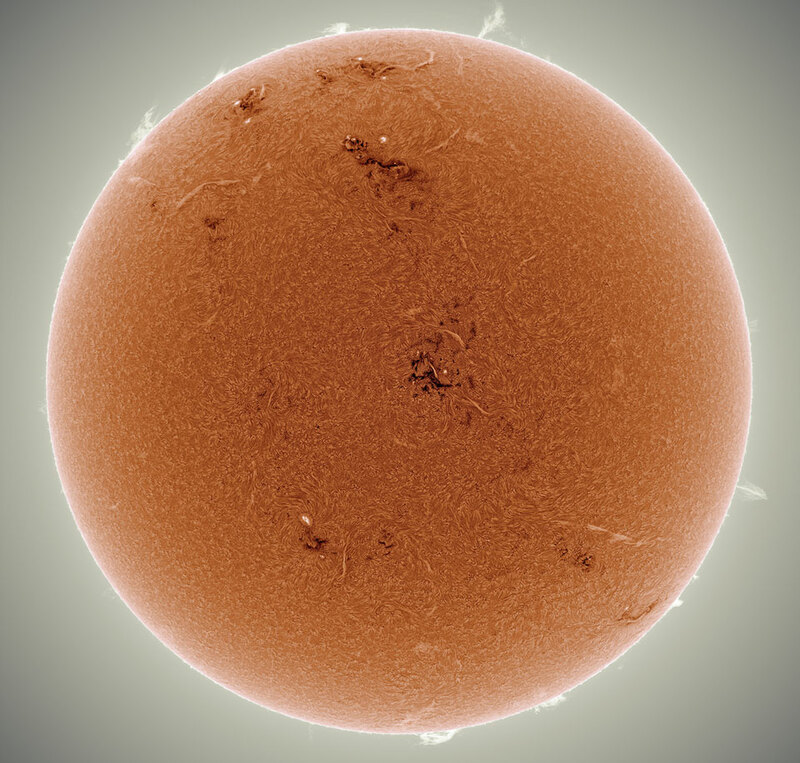 Just over the Sun's edges, several filamentary prominences protrude, while prominences on the Sun's face are seen as light streaks. Possibly the most visually interesting of all are the magnetically tangled active regions containing relatively cool sunspots, seen as white dots. Currently at Solar Maximum -- the most active phase in its 11-year magnetic cycle, the Sun's twisted magnetic field is creating numerous solar "sparks" which include eruptive solar prominences, coronal mass ejections, and flares which emit clouds of particles that may impact the Earth and cause aurorae. One flare two years ago released such a torrent of charged particles into the Solar System that it might have disrupted satellites and compromised power grids had it struck planet Earth.